For psychic seekers who aren’t quite ready to dive into the psychic journey headfirst, Psychic Center provides one of the easiest means of getting your feet wet. You can connect with a skilled psychic who has clear and straightforward answers and receive a low-cost trial reading, risk-free. That’s just one way Psychic Center is striving to provide personal answers with millions of insightful horoscopes and spiritual Tarot low-cost readings by e-mail every day. 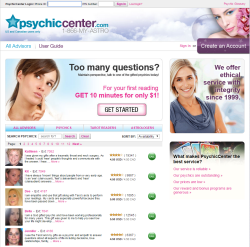 They’ve been around since 1999 and are owned and operated by Horoscope.com the same company that owns AstroCenter.com. No surprise, their services are heavily weighted toward astrology and the art of divination. In fact, tarot readers and astrologers have their own separate groupings in the All Advisors menu – right along with psychics. You can search within any of these three divination categories by psychic name, extension, rating, rate per minute and availability. You’ll be rewarded with a psychic profile that includes a detailed paragraph and a pre-recorded message to help you gain confidence that you’re making the right choice. Want to get a reading right away? A green “Call” button immediately alerts you as to whether your chosen psychic is available. A gray “Away” button is followed by the time and date the psychic will be ready, a handy feature that keeps you from repeatedly checking back. To simplify things further, you can add yourself to a callback waiting list and receive a call from Psychic Center when your advisor can be accessed. From there, the rest is a simple matter: follow the step-by-step registration process on the “My Account” page” and you’re ready to receive your online consultation. You can connect with the psychic you choose with reassurance, knowing that each is required to possess at least a year’s worth of experience and is screened and tested by providing a “substantial sample reading” to another qualified psychic. Based on this screening, you can anticipate honest, compassionate answers about your love and work life, financial issues, or personal growth trajectory. Of course, the first step is determining which psychic is right for you and Psychic Center’s website does not make it particularly easy. It is disconcerting to find only two categories in the top menu: All Advisors and User Guide. It’s also frustrating to be forced to click on the various profiles without being able to filter by specialties, tools, or reading style. The onus is definitely on you to wade through the profiles if you’re seeking a particular reading category – dream interpretation, aura reading, or energy reader, for example. Indeed, very little about the site is intuitive. For example, the satisfaction assurance is labeled “Claims policy”, and “Claims policy” is tucked away under “User Guide”. It takes work and effort to determine what will happen if you have a less than satisfactory experience. Once you do figure it out, you’ll discover that the satisfaction assurance is quite convoluted. Psychic Center offers to credit a maximum five minutes back into your account at the per-minute rate charged per call if you are not satisfied during the first five minutes of your consultation. But, you will not be reimbursed if your call is disconnected. To receive the credit, you must email within three days with a detailed description of why you were dissatisfied, including the date of the call, the advisor you called, the phone ID you used to log into your account along with your email in which you received confirmation…and then you will hear from them within three days. Whew! All you can do is hope you’re satisfied. One of the things that Psychic Center gets right is its generous introductory offer for new customers: 10 minutes for just $1. Given that most other networks provide just a couple of minutes – if that – their offer is definitely enticing and provides ample time to see if Psychic Center is right for you. If you decide that it is, it’s reassuring to learn that Psychic Center provides the lowest per-minute prices in the industry, starting at only $2.50 per minute. Each psychic advisor prominently displays his or her own per-minute rates so you can quickly compare. In fact, their loyalty rewards and bonus program is definitely a step above the others. They offer 10 percent cash back into your account if you spend $50 within any given month, as well as birthday bonuses, loyalty bonuses and special offer days. When you do make that special psychic connection, the impetus to continue is well worthwhile. And that may very well make all the difference to you.